It might have been my Dad, with his impressive collection of definitely camp, pink ordinance and survey maps prior to when I was born, who taught me how to map read. Grateful for my introduction into the folds of navigational wizardry (we seemed to often drive around rural roads in Britain at high speeds, playing Dire Straights), my directional skills when leaving Yellowstone were on the money. If you make the mistake of not knowing which way you’re heading and exit south from Yellowstone; to avoid entering a neighbouring National Park you have to travel over a hundred and sixty miles back to a different exit further north…without a fuel stop for over a hundred miles. 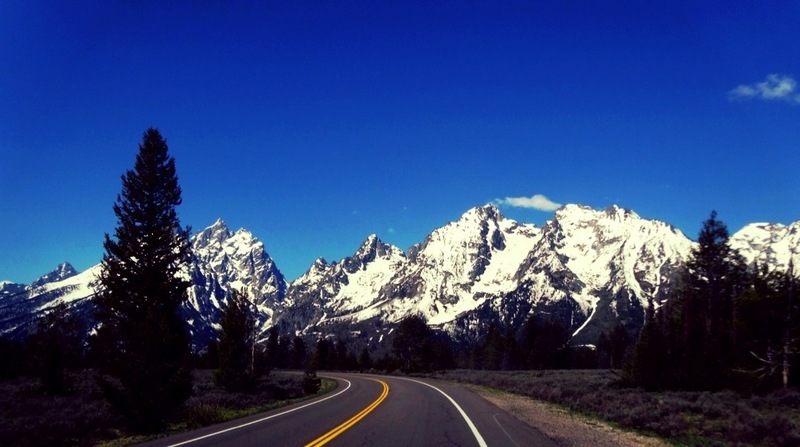 Why you would want to avoid Grand Teton National Park baffles me. I made sure I enjoyed entry into the smaller, well groomed, beautifully formed, sage brush-covered, protected area. It was on my “do not miss” list. 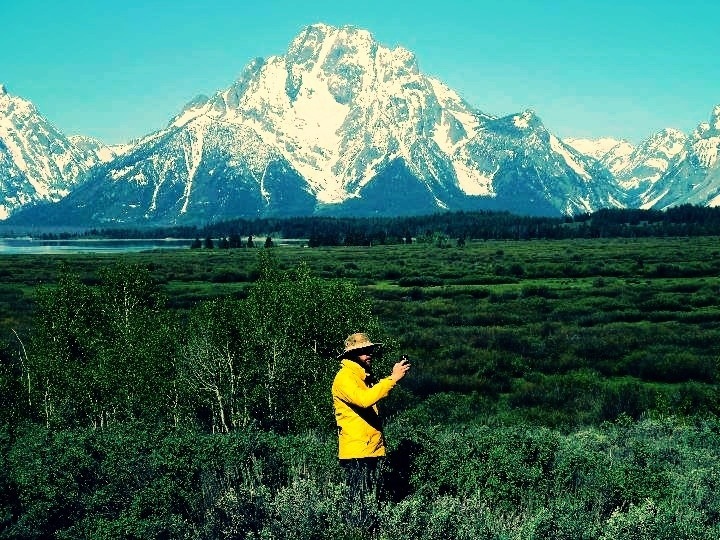 Following the agony and ecstasy of Yellowstone, Grand Teton National Park restored my faith in the way Americans conserve their natural heritage. Before I indulge myself in some Grand Tetons, I would like to mention that Yellowstone did have its perfect moments (which I might have neglected in my last post). My short videos may have summarised some of my knee jerk reactions and troubling thoughts on the way Yellowstone operated, and even though I think they were justified, I witnessed up close, calving elk, had view points all to myself because I ventured out at dawn, learnt a lot about Yellowstone’s history, to which I was previously ignorant, spotted multiple species of wildlife that I consider an utter treat and I was astounded at the vast array of natural geographic phenomena and breathtaking beauty that spilled into my senses every few minutes. 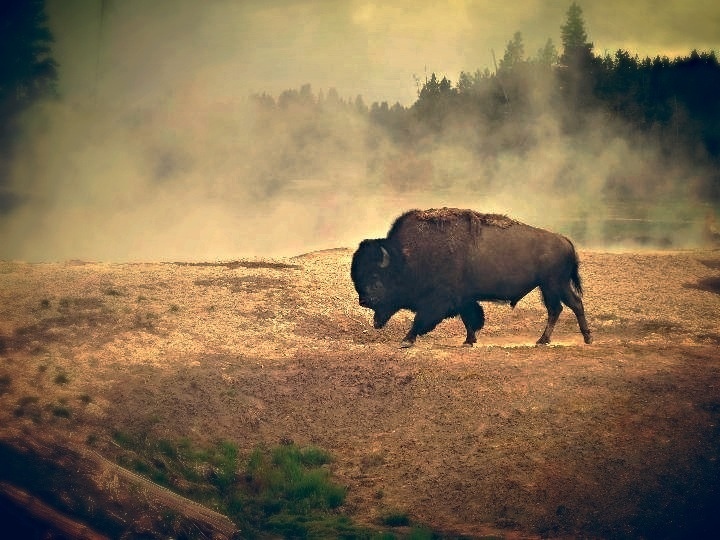 Despite a few niggles, I still have the utmost respect for what Yellowstone achieves, although I do hope it can move away from its sugar coated version of the wild, and resist catering for the herds. 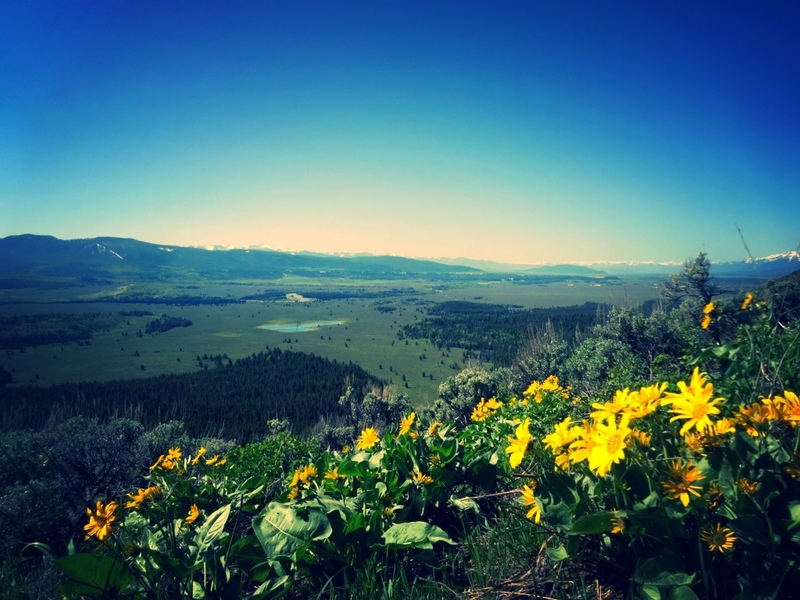 I travelled south through the effortlessly beautiful Jackson hole valley. Oddly, with it being the neighbour of Yellowstone, the two parks couldn’t appear more different. 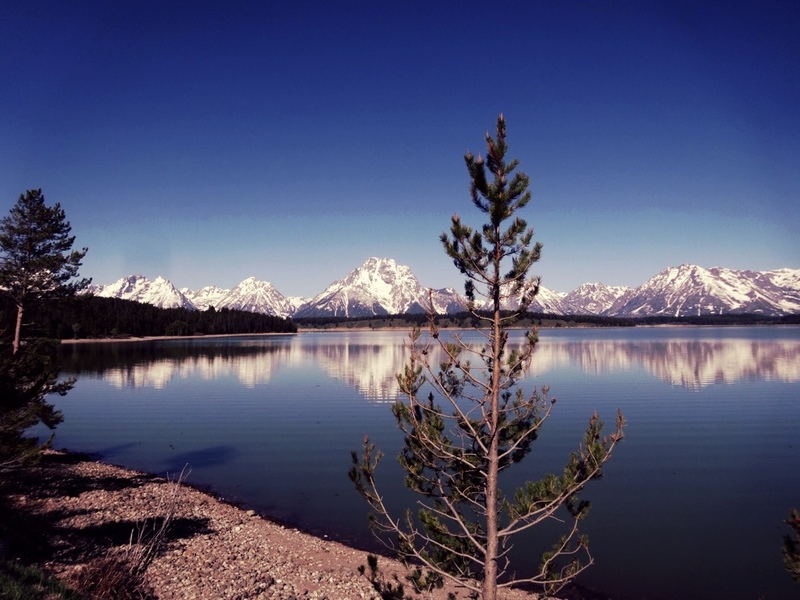 Quiet in comparison, Grand Teton slipped evocatively into the sublime. The new mountains dropped down drastically into clear, clean, postcard-perfect lakes; then a wide, lush, flower-full valley, carved out by the numerous glaciers that once slid through this impressive landscape flows towards rolling hills: each hill harbouring their own enigmatic view of the scene I was adventuring through. The aroma of the valley will always stick to the memory of my now moustachioed upper lip. Sage brush bathed the landscape as well as my now, soaped-up, intoxicated brain. The smell of pine also sporadically and pleasantly interrupted the perfect roast potato flavouring. It momentarily took me back to mid-week roast dinners in the Kent countryside, as friends would always moan that they preferred a sageless potato. Sage-haters! KP reminisced of his time here over thirty years ago and was in constant surprise, and disappointment, of how much it had changed. For a second, he was almost in tears that the little town of Moose had been replaced by the new, large and modern looking visitor centre now occupying the south skirt of the park. Possibly an erection inspired by the monstrosities in Yellowstone, but let’s not moan about that. 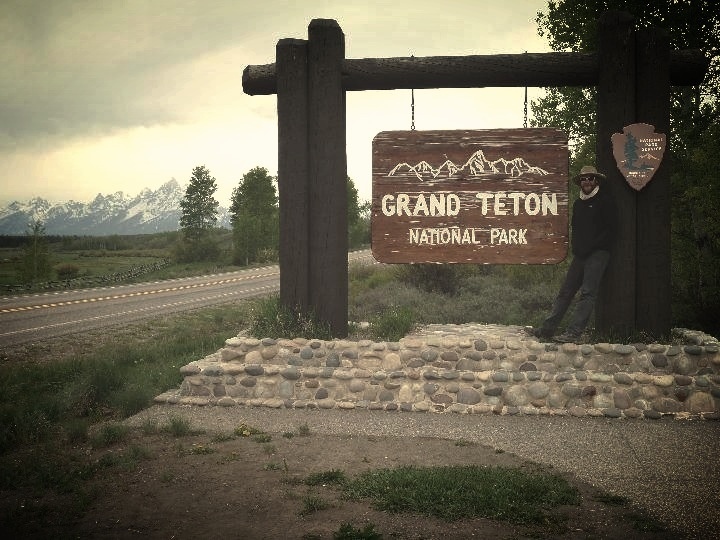 I actually found the hidden buildings within Grand Teton to be rather in tune with the surroundings. KP was almost again in tears….of delight, when we found that the town of Moose hadn’t disappeared at all, it was hidden away, just across the road from the visitor centre where it had always been. Moose hadn’t changed at all; a tiny village with a restaurant, a cafe, a convenience store – now with some hipster sandwich makers, a gas station and an outdoor apparel store, in fact the only thing that had been altered in thirty years was the arrangement of the vegetables on the shelves in the store, as KP oddly reminisced. 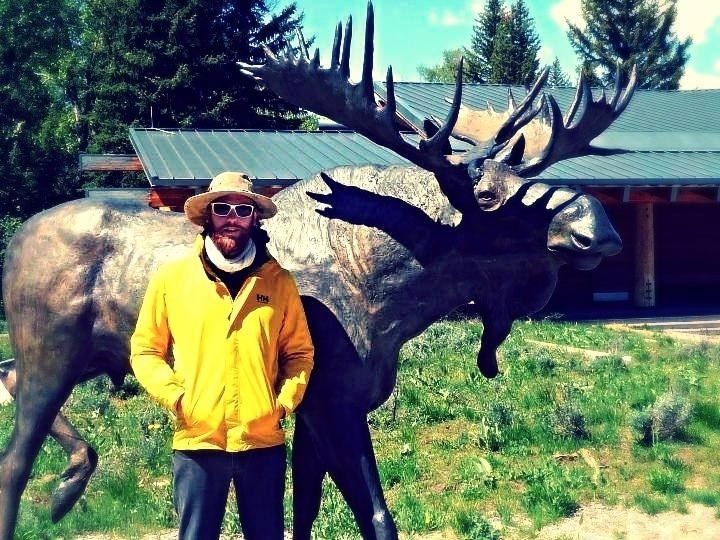 Moose is simple, tiny and buzzing on Thursday nights because the restaurant has a weekly barbecue, yet it is somewhat frozen in time and perfect for the understated, yet majestically formed national park that it holds hands with. 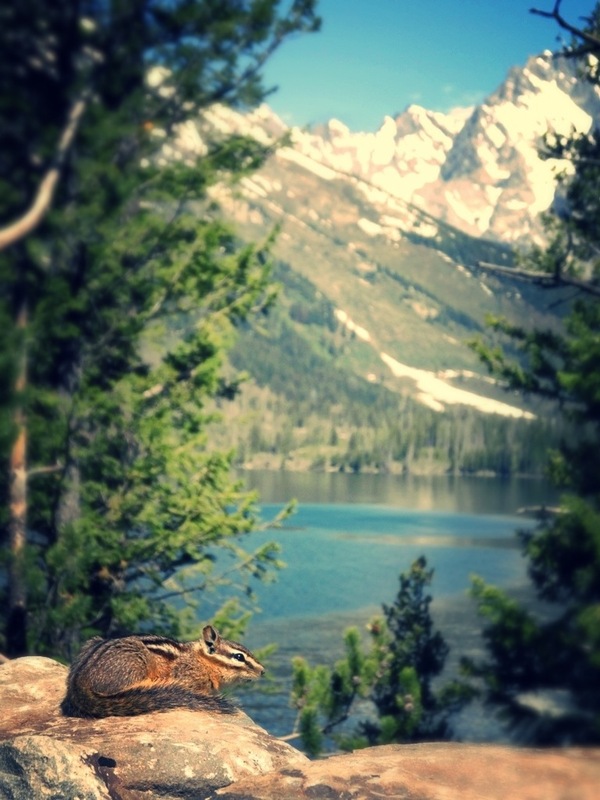 I have had a few camp spots that have raised a few eyebrows, and a few that no eye brows have come across, but north east of Grand Teton National Park, on the Buffalo Valley Road, the ground squirrels entertained me like miniature Shoalin monks, only without orange robes and slightly higher-pitched voices (although admittedly, I have never heard a Shaolin monk speak). The new horse feed shed was erected because bears constantly abuse the food stores, but as it was too soon and too cold in the season for bears, I sadly didn’t see any. Many of the towns around Grand Tetons had changed drastically in the 30 years KP had been absent. They now sprawled, sporadically along the highways and into the hidden, quiet crevices of the hills. Farm buildings, stores and dude ranches are dotted around the valley. The market dropped out of the ranching industry around a century ago; ranchers turned to tourism, giving city dwellers an experience of their rural lifestyle. For the townies who wanted to dress and ride like wild folk in the hills, it was a boozy holiday and a slice of the countryside on horse back. The chance to hunt or see american wildlife in its natural habitat was also an attraction away from concrete jungles and some operate today for Wild West getaways. Some National Parks used to be home to some of these ranches, but now they have either been dismantled, or set up as mini museums (such as in Dinosaur National Monument or the ranch in Rocky Mountain National Park, Colorado). The town of Jackson is a tourist Mecca, a metropolis of tour buses, travellers, souvenir-purchasing, cowboy-wannabes and the brand-wearing youth. The amount of hip coffee shops, expensive restaurants, pricey art galleries and extortionately priced properties in estate agent windows was overwhelming for such a small town – but it runs on tourism and well-moneyed, seasonal trade. As it is the resort town of the winter ski season, it is clearly the place to be seen, yet it was deafening on my wilderness-accustomed ears. I found it difficult to communicate on an appropriate level in the populated area – a skill which had escaped me while travelling through the lesser populated, much colder, more rustic and quieter places of the north west USA. Coming back to civilisation was a hard realisation and while my senses were overloaded with tourism (one chap hadn’t been in the presence of people for quite a while and just wanted to talk the arse end off any donkey, for as long as he possibly could), my vocal chords froze. 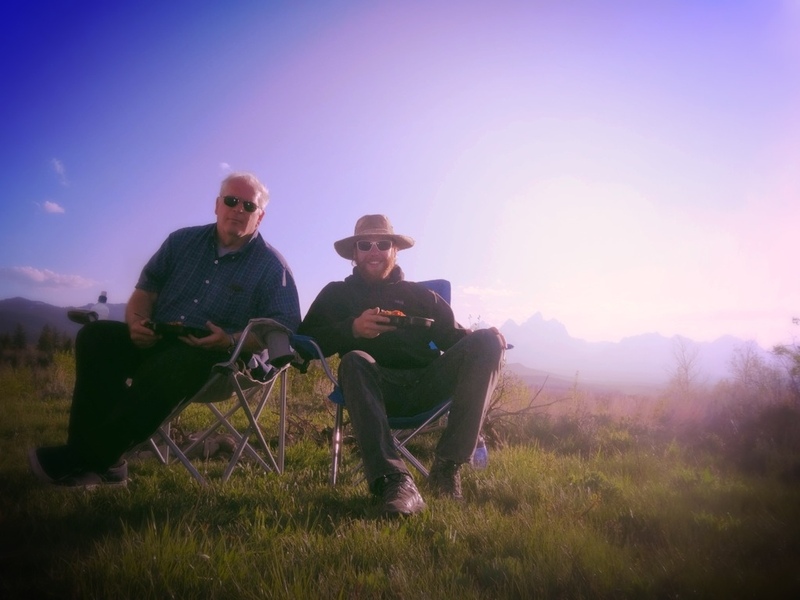 At the north east end of Grand Teton, we found a campsite up a dirt road. It was last time KP and I would share a campfire, so I made sure I went to town in the kitchen. It was possibly the most appreciated moment of our journey together. The memories KP has of this place are, I think, the most precious in his life. At every turn I could see the humbled smile and contentment on his reminiscent face. He was on his belated and overdue adventure back to his youth and he shed a tear when he stood aloft Signal Mount for the first time in 30years. I felt sheer a privilege that I could witness his joy. Experiencing memorable, emotional, exciting and sometimes difficult things alone in this world, are often times that many live to regret. I have felt the sadness of not being able to share my experiences with those close to me regularly on this journey, and I will always be comforted that KP told me how happy he was to share such a personal moment with someone he respected as a true friend. He said he couldn’t have shared this trip with anyone better (although I think he would have said that just as freely, to a wonderfully adventurous, intelligent and cuddly 60year old woman – I won’t hold it against him). The dramatic landscape never ceased to remind me that I was witnessing epic, natural beauty. Although a major attraction in the park, the picturesque Jenny Lake, where trail heads begin and small ferries run hikers and climbers across the water, felt small, understated and respectful of the wilderness (my videos are on youtube). I believe Grand Teton is the only national park with a commercial airport, but even it was small and apart from some leer jets parked, discreetly on the wooded horizon, you wouldn’t know it was there. It struggled to overwhelm the valley and it seems everything here has been designed and constructed to keep the wild landscape as natural and as unaffected as possible. This is how it should be. 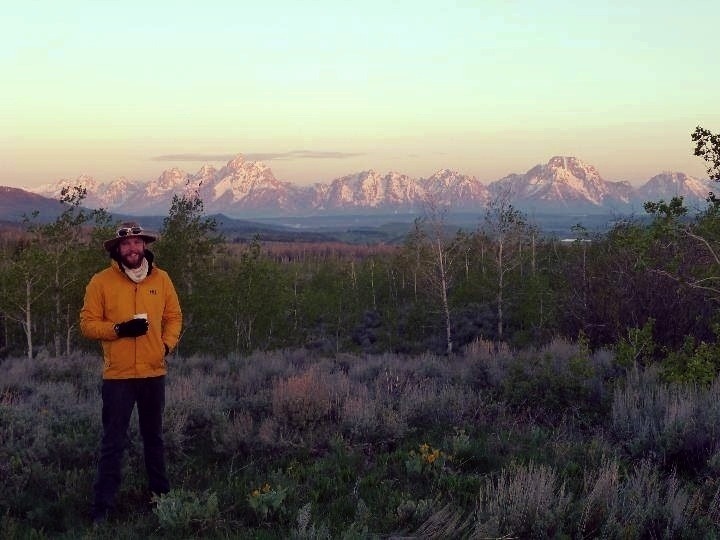 Although not my favourite natural stop on my trip, Grand Teton and Jackson Hole struck an emotional chord. Maybe it was sharing a ditherithing, older gentleman’s reminiscent memories, maybe it was the grandeur of the mountains so close I could touch them, maybe it was the peacefulness following such a crowded, cartoon experience of the wild in Yellowstone, maybe it was the aroma of sage, pine, melt water and a cowgirl’s leather chaps that seeped from the history of the valley and small wooden towns, or maybe it was just the fact that everything combined, makes Grand Teton what she is – a humble, seasonal, remotely quiet, mountain-influenced and beautiful wilderness which people don’t appear to have overwhelmed. She also smells wonderful, like my preferred roast potato flavouring.. 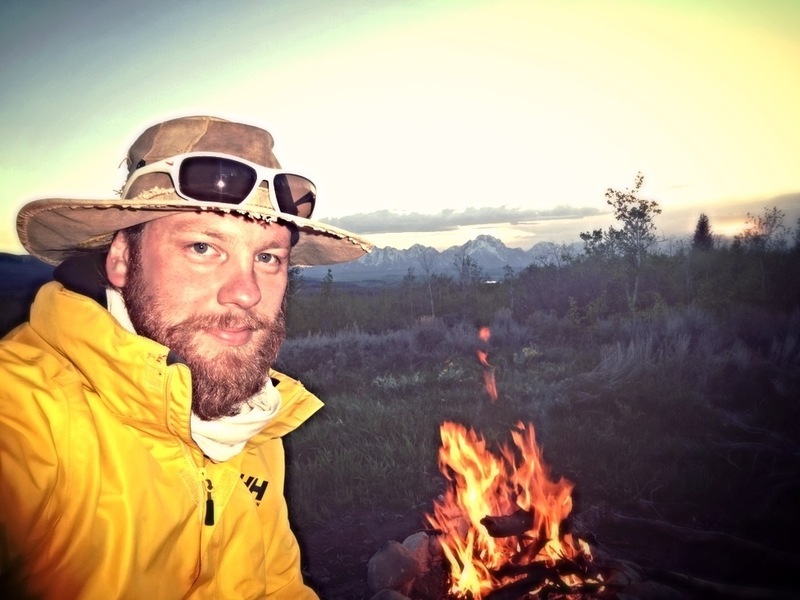 This entry was posted on August 30, 2014 by winstonwolfrider in USA on $6 a day and tagged adventure, beard, beards, Camping, chipmunk, cowgirl, donkey, grand Teton, hiking, National park, navigation, park, social, Yellowstone.